All I keep hearing about is Spring Break and Spring Break vacations. While this topic of conservation is exciting to some, I don't have Spring Break plans. All I want is a day off or a day at the spa. For the ever busy mom, a day of pampering is a total luxury. The time away combined with someone talking care of me are two events that I dream about. Since my fantasy is just a dream, I've taken to have my spa day at home. My at home spa has tons of benefits. Frist, it's cost effective (definitely not hundreds of dollars) and it is open all hours (don't have to worry about a babysitter). Luckily there are various products that provide expensive day spa treatments to your home. One is Tropical Mango Shea Sugar Body Scrub. 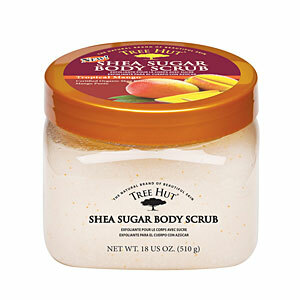 The Tropical Mango Shea Sugar Body Scrub is a great way to smooth and nourish your skin. The mango puree is full of vitamins, minerals and anti-oxidants. These ingredients prevent dry skin and help to prevent wrinkles. The organic shea butter promotes elasticity and moisturizes your skin. Additional ingredients helps to rejuvenate and protect skin from daily life. Since I was having a spa day at home, I used the Tropical Mango Shea Sugar Body Scrub in a long, hot, steamy shower. I used my hands to lather the scrub all over. The scrub wasn't too abrasive, which is very important to me. I don't want to feel that I have sandpaper on my skin. For me, the best part was the mango scent. I felt transported to my favorite tropical beach. After using the scrub, my skin felt amazing. It was easy to use in the shower. My legs were smooth yet not greasy. Since I workout a lot, I could tell that I removed lots of dead skin from my arms. I was definitely ready for a sleeveless top. Another great use of this scrub would be for an at-home pedicure. With warmer weather and sandal season quickly approaching, I want my toes looking pretty. This scrub would make my feet ready for those open toe platform sandals that are calling me from the closet. Tropical Mango Shea Sugar Body Scrub can be purchased for $6.99. With Easter right around the corner, this product would be a great addition to mom's Easter basket. Would you like to try Tropical Mango Shea Sugar Body Scrub? I have one to giveaway. Please use the Rafflecopter to enter. nuNaat hair mask and a Perfectceuticals facial mask. 30 minutes of relaxation -- yay! I LOVE this stuff. I think the mango is incredible! A hot shower with a good body wash! I love taking a Hot Bubble bath. bubble baths and face masks! I love a face mask and a little nail painting. I make a special bath salt mix - good for whatever ails you! Doing my nails and a nice long shower! My favorite at home treat are bath bombs, love the way they soften my skin! I love to scrub my feet and massage my legs! face and hair mask. I look like a monster, but feel so great after!!! I love a good facial! Love tropical sugar scrubs & body butter!! I love doing at home facials. I like to take a relaxing bath with a facial mask. Definitely a bubble bath with with a little apple cider vinegar. Deep conditioning for hair and facial peels.